How Important is Knowing God’s Word? 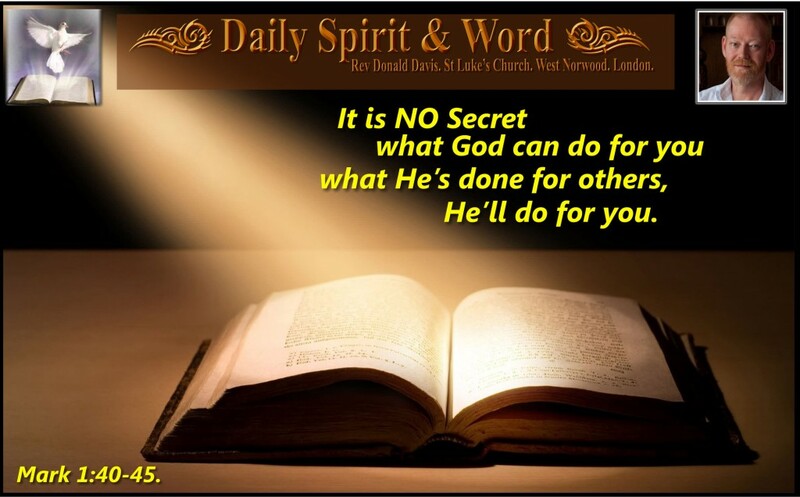 Daily Spirit & Word, 448: How Important is Knowing God’s Word? Good morning my friends, I’ve been reading a little book about getting God’s Word into our memory banks, the importance of knowing God’s Word. Today, I’ve copied a little story for you, it’s powerful and will encourage you in your walk with Jesus. The story will move you to tears and strengthen your resolve to get to know God’s Word better. Taken from 100 Bible Verses Everyone Should Know: “One night several years ago I sat up into the wee hours, engrossed in a book I’d picked up at a yard sale. ‘In the Presence of Mine Enemies’, it was the memoir of Vietnam POW Howard Rutledge, who was shot down over North Vietnam on November 28, 1965. When his plane was hit, Howard bailed out, but he descended into thick mud near a large village and was soon surrounded by a crowd welding knives, machetes, and sticks. Forming a ring around him, the townspeople blocked his escape and descended on him, pounding him with blows, stripping off his clothing, and dragging him into their little jail, half dead. Shortly thereafter, he was transported to the infamous Hanoi Hilton where he was brutally interrogated and tortured. Howard described how, in an initial set of tortures, his legs were forced into rough shackles, with his arms hog-tied in an excruciating position. He was deprived of clothing, food, and sleep and forced to lie on a cold slab in a mucky cell. The walls, floors, and ceilings were caked with filth, and a large rat shared his space. Until his incarceration Howard had felt little concern for spiritual things; but now he desperately tried to recall snatches of Bible verses, hymns, or sermons he had heard in his childhood. Fortunately as a youngster he had attended a church in Tulsa, Oklahoma, with a Sunday school that had stressed the importance of Scripture memory. There in the POW camp, he racked his brain for every single verse he could recall. During the rare moments when he could communicate with other POWs, he found them seeking to do the same. With a friend’s help, Howard even managed to reconstruct verses 17 and 18. In his memoirs Howard described days and nights of tortures that made my skin crawl as I read about them; but he also testified of being able, as time progressed, to recall more and more Bible verses from the recesses of his mind. His recollection wasn’t word perfect, but he was amazed at how many phrases and sentences from the Bible lay buried deep in his memory, waiting to be discovered. Those Bible verses literally kept Howard Rutledge from losing his mind. The memorized snippets of Scripture in his brain were potent. They faced down death, rallied his spirits, steeled his nerves, and tapped into the deepest strength known in the universe. They beat back the torture, stifled the despair, subdued the terrors he felt, and maintained his sanity even when he was immobilized for days in a stifling hut, chained to a metal frame, lying in his own waste, and covered with ants, flies, and biting insects. Those verses, long ago learned by heart, proved more restorative than any tonic. They dispensed strength and were sufficient to the pain; and they bolstered his mind and his mood with the strongest thoughts of an omniscient God in the midst of humanity’s most sadistic ravings. They were the reason he came home alive. Most of us will never be POWs in a concentration camp, but all of us occasionally find ourselves at Heartbreak Hotel. Life is hard, full of anguishing moments and dangerous temptations. We need strong minds – brains that think clearly, emotions that remain calm and steady. 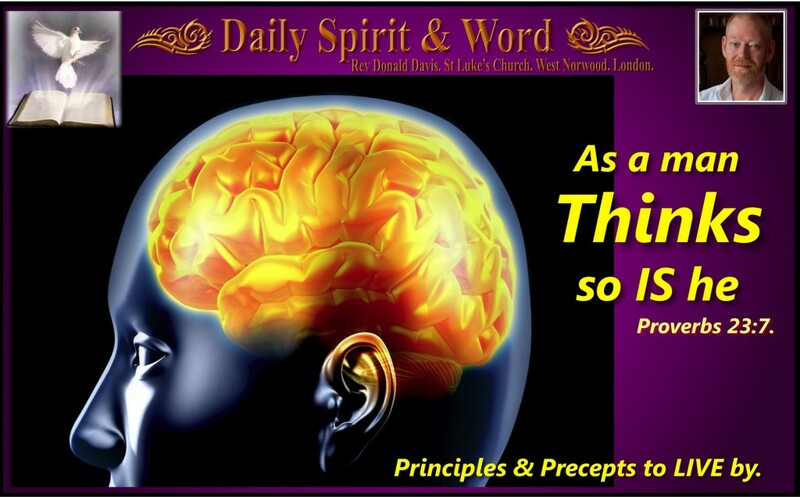 Bible verses, committed to memory and applied by the Holy Spirit, are the most powerful medications in the whole world. They’re a balm for sore hearts, an elixir for low spirits, an immunization for bad habits, a booster shot of high spirits, a pick-me-up for dreary days, and a stimulant for positive nerves. How many Bible verses could you reconstruct from your memory banks if push came to shove? Here’s the little verse again, hopefully the importance of knowing God’s Word will sink down deep today and you’ll begin to hide God’s Word within your head and heart, then with the Holy Spirit’s help, they’ll surface just when you need them. P.S. We’ll be sending out links to a brand NEW Bible Memory Course coming very soon. 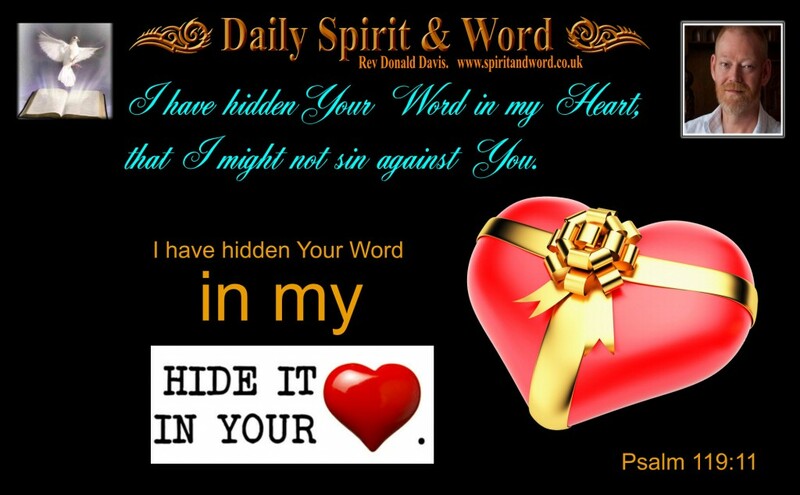 If you want to know more, please let me know and I’ll add you to the list of those who want to learn; “HOW to Hide God’s Word in your Heart”. 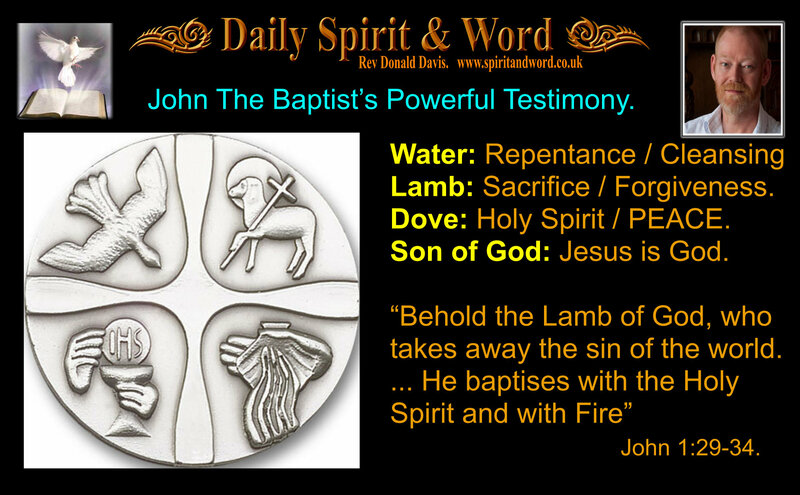 John The Baptist’s Powerful Testimony: The Water, the Lamb, the Dove and the Son of God. Daily Spirit & Word, 447: John’s Powerful Testimony. The Water, Lamb, Dove and the Son of God. 29 The next day John saw Jesus coming towards him and said, “Look, the Lamb of God, who takes away the sin of the world! As a Magnifying Glass makes things BIGGER: So John’s Witness about Jesus makes Him much BIGGER for each and every one of us today. Here’s HOW! You know my friends, there is nothing more powerful to lead others to Jesus Christ than by our own witness or testimony of who Jesus Christ is: both to us and to the world. That’s what John the Baptist revealed in his own life and it’s what Christians can reveal to the world today. We’ve observed the POWER of this fact in the face of debate and doubt: Whilst out on the streets witnessing, we’ll come accross many people who’ve got strong arguments and reasons for not believing in God or Jesus, but after trying to debate them on an intellectual level for a while, we’ve seen how just one or two words brings those strong defences, (These are the Castles they built to hide from God) intellectual and moral doubts come crashing down. When we say, “I know God because I’ve met God personally through Jesus” there’s absolutely nothing they can say. Apart from thinking, either we’re mad or deluded or we’re telling the truth. There is POWER in personal testimony, that’s what John the Baptist brings us today. John’s message was: “Repent and Be Baptised for the forgiveness of Sins.” (Baptism means to submerse, to sink to go under, to go down underneath and into the water). Baptism was something people always did to themselves, but this was very strange, now a man came calling people to come to him to be washed in running water, to be cleansed of their sins. But first John said that people must REPENT. The people at the time knew what John meant, but we’ve don’t have the same understanding of God’s Word, the Old Testament. He was calling the people to come back to God’s ways, God’s will revealed in the Law and the Commandments. Repenting is simply acknowledging we’ve failed and fallen short of them, turning away from sin and desiring God’s cleansing from Sin. (Sin is the Transgression of the Law of God). Washing in Water was always a symbol of RITUAL CLEANSING. Baptism = Repentance and Forgiveness / Cleansing from Sin. John was saying, “Behold” which means LOOK PAY ATTENTION TO WHAT I’M POINTING OUT. In Israel: The Jews sacrificed pure, innocent and spotless lambs, this was God’s given symbol of purification. The blood of the lamb was to show that their sins had been washed away, but that sin has a price, “The wages of sin is death”… The Lamb died in the place of the people, because sin must be paid for. Imagine that, an innocent, pure little lamb: The people would most surely have the same feelings for little lambs that we have today. They are cute, lovely, innocent, spotless and cuddly: But they needed to die to pay the price for their sins. seems cruel and barbaric to us today, but God was showing the people something about SIN. How much it hurt him and how serious sin was to him. Now John was saying something awesome: Just like people would wash themselves to purify themselves, so Israelite People would bring their own lambs to be slaughtered. It was their identifying with their own sin. It’s like saying to God, “It was me, I did it, now I bring this little lamb to suffer in my place”… Now John is telling the people, God is Himself providing the Lamb for Sacrifice: Jesus would be God’s Lamb who would be sacrificed to take away the sins of the whole world. His precious blood would pay the price for the sins of everyone. He was God’s pure, spotless and sinless Lamb. For many thousands of years, since the time of Noah, the Dove has been well known as the international symbol of PEACE. Often depicted carrying a leaf in it’s mouth. After the flood, that destroyed every sinful human being apart from Noah and his family, when the waters receeded Noah sent out some birds to find land, the dove finally returned to Noah carrying an Olive branch in it’s mouth. This meant the end of God’s wrath, the flood abated and PEACE with God was restored. He’d finished his work of cleansing / PURIFYING the earth from Sin. Water: Now the earth was appearing again and the Dove brought the symbol of God’s Peace. My friends, when the Holy Spirit came down from Heaven and entered Jesus, He came in the form of a Dove. Notice what John said though, The Dove came down and rested on him and remained upon Him. The Holy Spirit NEVER left Jesus again. Jesus was and is the one who sends the Holy Spirit into the hearts of everyone who comes to Him in Repentance seeking the forgiveness of their sins. He died upon the Cross as God’s Lamb to take away those sins. He now gives the Holy Spirit to each and every person who TRUSTS in His death upon the cross, that it was for their sins. His precious, spotless, innocent and holy life-blood poured out on the cross for your sins. Jest like the Holy Spirit remained upon Jesus, so the Holy Spirit will be with the New Believer forever. He’ll fill you and give you what John said here, “FIRE”… Fire = Zeal for God. Love for God, Devotion to God, Dedication to God’s ways. That’s the FIRE it means the ability to live in such a way, that your life will be pleasing to God. The Holy Spirit really is a symbol of PEACE between mankind and God. That God was finished with the punishment Jesus had taken all the punishment necessary for SIN and now God was sending the Holy Spirit to reveal the True PEACE between the believer and God. The PEACE in your heart is a fruit of the Holy Spirit. My friends, John saw the DOVE (He’d been given a message and a method of getting people ready for Jesus coming: Repent = turn back to God away from sin. AND be baptised to be PURIFIED from those sins) NOW after years of getting people ready, he finally saw what God had told him from Heaven. “When you see the Spirit come down and remain upon him, he is the one who will baptise with the Holy Spirit and fire”…. I’ve seen Him, this is the one, this is the Lamb of God, Jesus Christ is the SON of God. And as I said at the beginning, there is nothing more powerful than personal testimony, personal witness, personal knowledge: “I’ve seen Jesus, I know Jesus, I’ve been with Jesus” What has Jesus done for you? He’s forgiven my sins (How did that make you feel). He died for me (How does it make you feel how Jesus died for your sins). He came into my life: Now tell people what your life is now like with Jesus, in comparison to what life what like without Jesus. He filled me with His Holy Spirit: Now tell people what it’s like being full of the Holy Spirit. How you know the PEACE of God. With this POWERFUL testimony, what Jesus came to do, what Jesus has done for you, you can go out and be confident that God will use it to bring others to the same faith and confidence that you have in Jesus Christ. Knowing Jesus Christ personally is all the training you need to become a powerful EVANGELIST to lead others to Him. These Make for a VERY POWERFUL TESTIMONY. What’s the Water For? Repentance and Forgiveness (Cleansing & Pruification). What’s the Lamb for? Paying the Price in Blood for Sins. What’s the Dove for? Assurance of PEACE within each and every Repentant Sinner who receives Jesus as Lord. What’s the Son of God for? He’s the Lamb, He’s the giver of the Holy Spirit, He’s the one who paid the price for sin. 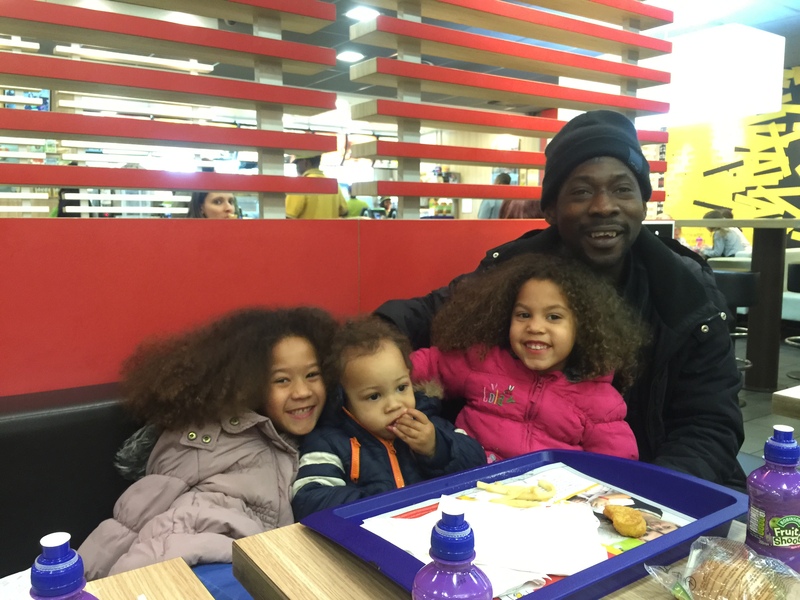 Why do we need a Personal Testimony like John’s? Because God has revealed just how precious each soul is, that He doesn’t want anyone to perish, but everyone to come to repentance. So He’s given you a task of spreading this Good News of Jesus to everyone and He’s given you a personal encounter and filled you with His Spirit to accomplish the task. If you’ve not got this FIRE (Zeal) to share Jesus with others, then there’s something wrong with your faith. God’s LOVE compels us to share with others what He’s given to us: So share Jesus today. If you’ve never done so before, can I encourage you today to come to Jesus Christ; Repent and seek His forgiveness, know that He’s paid the price for all your sins upon the cross and turn to Him now. He’ll give you the gift of the Holy Spirit as a way that you can know that you’ve been forgiven, your place in Heaven is secure and you are living a PEACE with God forever. Come NOW is the Day to be SAVED from Sin. Come today is the day of Salvation from sin. 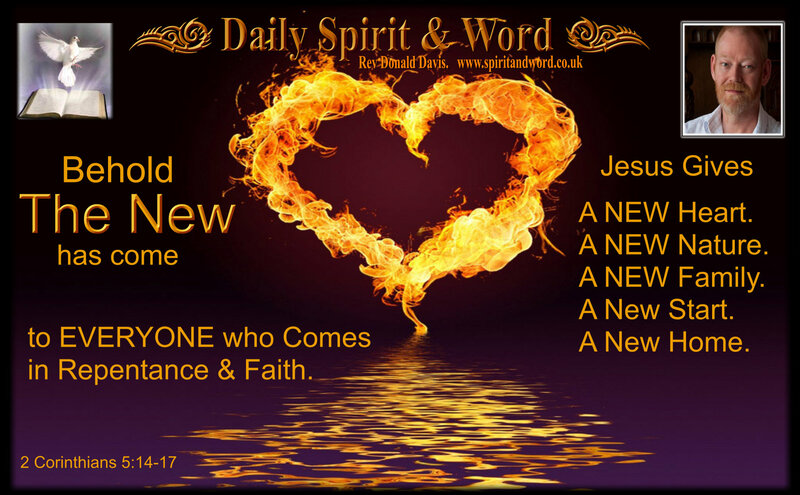 Daily Spirit & Word, 446: New Man in Old Clothes. Good morning my friends, I’ll never forget the day that a man who’d been searching for Jesus for some time, finally gave his life to the Lord and came into church the next Sunday, he looked physically different, everybody noticed it, it was like he’d come alive and was shining with the Glory that Moses had when he came down the mountain. One of the men in our fellowship nic-named him “Shiny Man”…. But there is a truth in what happened to him for all of us, we can all get that Glory Glow ourselves, by coming to Christ and being converted from a sinner into a saint. Or if you’ve become like a smoldering wick, your faith has grown weak, it can become be set ablaze with the LOVE of the Lord and you’ll get a NEW FIRE in your heart again. 16 So from now on we regard no-one from a worldly point of view. Though we once regarded Christ in this way, we do so no longer. Notice that; “If you are IN CHRIST” then you are a NEW CREATION, the old has gone and the new has come. 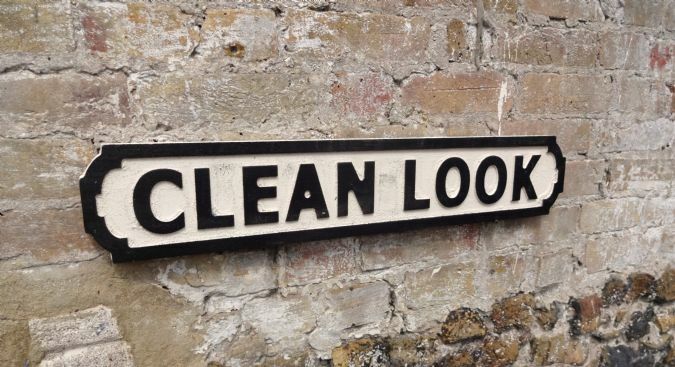 What is the ‘OLD’ That is gone? The old nature; the sinful natural nature that you’re born with, you are no longer a slave to sin, but that doesn’t mean you wont sin anymore, you’r just not governed, ruled or dominated by it. It’s like Jesus promised, “You shall know the TRUTH and the truth shall set you FREE”. You’re set free from sin and given a new SPIRITUAL nature, one that has the power to resist sin, to say “NO” to ungodly desires. What is the ‘NEW’ that has come? The NEW NATURE. The Bible has many words to help us understand what happens at Conversion to Christ. The word Conversion is one of them: We’re converted from a Sinner into a Saint when we put our trust in Jesus. Being ‘Born Again’ is another; we’re born anew, born from above. We’re born again from the human family into God’s Holy Family forever. “A man got up in one of our meetings in New York some years ago, who had been pretty far down; but a wonderful change had taken place, and he said he hardly knew himself. He said the fact was, he was a new man in his old clothes. That was just it. Not a man in new clothes, but a new man in old clothes. Behold ALL Things Are Become NEW: Asesome! You’ve been transformed my friends, the world looks at how good you look on the outside, but the LORD looks upon the heart. (Remember how he chose King David, by looking into their hearts the LORD refused his brothers, but David’s heart was different according to God). The OLD has gone, BEHOLD THE NEW HAS COME. the new nature within desires different things from the old nature, this is how you can tell if you’ve been born again or not, because you’ll no longer desire the same old things. Old things with pass away and new things, the things of God will become increasingly part of your new nature. Have an AWESOME Saturday with Jesus today. Live your new life in the old body, but know that one day, you’ll receive your eternal clothing soon. Grandmother and Mother’s Sincere Faith. 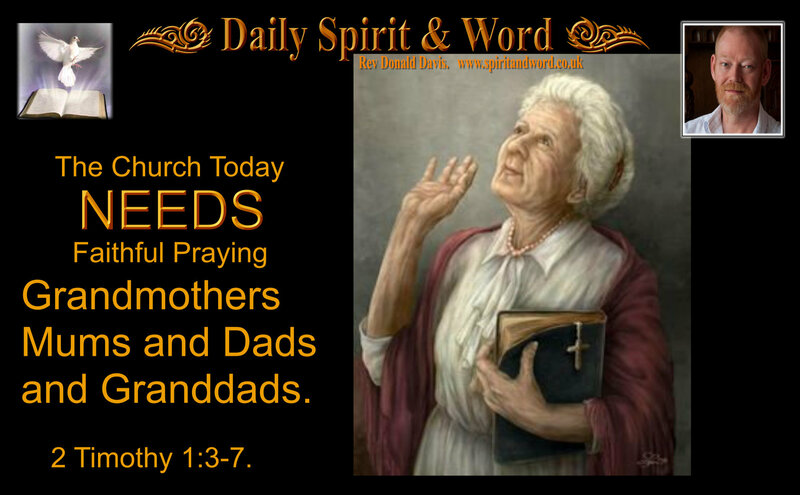 The Church Today NEEDS faithful, Praying, Grandmothers, Mums, Dads and Granddads. 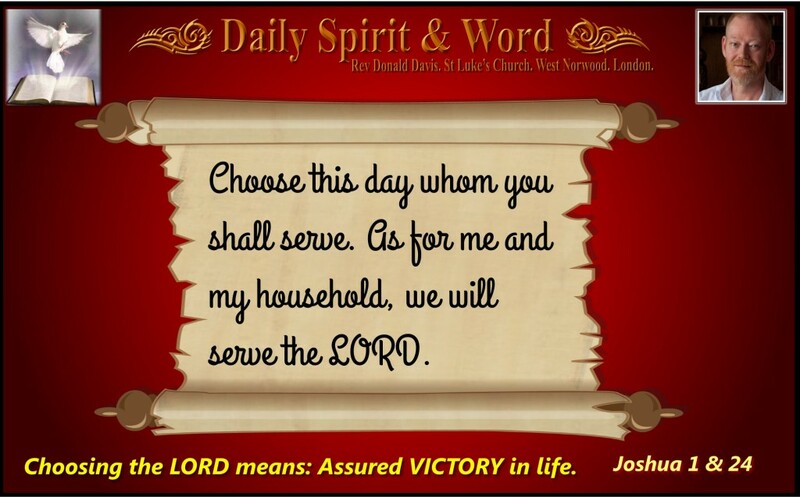 Daily Spirit & Word, 445: Grandmother and Mother’s Sincere Faith. The Church today needs more faithful Grandmothers and Mothers, who’ll be able to ignite the faith of Jesus Christ in their children and grandchildren. Good morning my friends, I was really encouraged this morning reading through 2 Timothy, by Paul’s devotion to praying for him and the way that Paul was encouraging Timothy in so many ways. The things that jumped out at me were having people in our lives who are inspirations to keep us going, examples that we can follow and emulate and encouragements to know that because God was active in their lives, He’ll also be with us on the journey too. When children observe a Mother praying at home regularly. When she has a sincere faith it will leave a life-long impression upon her children and even her grandchildren. Paul’s remembering back to his faithful praying ancestors: It’s good for us as Christians to have heroes of the faith, men and women of prayer who’ve served the Lord Jesus Christ faithfully in all kinds of circumstances. When I was a young Christian some old saint gave me a book and said, “Read this, pray about it and ask God to help you to be a Christian like some of these were”. I took that book with me to sea and read it upon my bunk on the Submarine hundreds of feet below the surface of the icy cold waters of the North Atlantic. I was, as far as I knew, the only Christian aboard. It soon became known that I was using a room on the Boat for prayers, for months no one joined me. Then a young man, Shawn Frow, gave his life to the Lord and we began to meet almost every day; to pray, read the Bible and sing and praise the Lord. Me upon my guitar and he with faltering voice because he’d never sang hymns of praise in his life before. I shared the contents of the book with Sean and together we marvelled at the old saints. We were encouraged aboard a boat full of unrepentant sinners to be faithful to the Lord in all things and to be His witnesses. People began to be interested and requested the Bibles that took up half my bunk. I’d intended to give them away to folks, but it didn’t’ begin happening until young Shawn became a believer and we prayed together about it. When you think about FAITHFUL Christians and how they served the Lord and what the Lord did through their lives, you too will be encouraged in your own situations, you’ll be enthused to walk as Jesus did, in faith and power of the Holy Spirit. So I would encourage you to get to know the Saints of the past as Paul did, his “faithful praying ancestor”s. Even if you don’t have any in your own immediate family who love the Lord, then you have them in abundance in the Lord’s Family of believers. Read, study and meditate upon the lives of people like: George Muller, Isobel Khun, Billy Bray, David Brainerd, Robert Annan, David Wilkerson and Jackie Pullinger. Faithful saints who gave up the world to follow Jesus and it’ll blow-your-socks-off what Jesus did in and through their lives; but what was it that made them so great, such heroes of the faith? PRAYER and BEING WITH JESUS REGULARLY. Here’s a little account of Susanna Wesley (The Mother of John and Charles Wesley, the Great Methodist Preachers and Hymn Writers). “Since there were no afternoon church services, Susanna began an evening family gathering where they sang psalms, prayed and Susanna read a short sermon from her husband’s library. It began with the family and the servants but soon word spread and others neighbors appeared, and soon there were too many for the parsonage. Susanna had written her husband of what she was doing, but then in his own letter when he perhaps saw the services as competition, Mr. Inman complained to Samuel. His claim to Samuel was that such irregular services could cause criticism or even scandal for the church. For while women have been ordained in many Methodist churches for more than 50 years at that time the idea of a woman having any part in a worship service – even in her own home – was unheard of. Samuel suggested to Susanna that she have someone else read the sermons, but still Mr. Inman complained and finally Samuel told Susanna to discontinue the meetings. However, she declined as she described how the meetings were a genuine and effective ministry to those who attended and that Mr. Inman was about the only one who‘d objected. The services continued.” Taken from the site History’s Women Read more about Susanna by clicking the link. NEXT Timothy is encouraged to do the same thing too: To remember the faithfulness of his own Grandmother and Mother. In an ideal world there would be generations of faithful relatives who loved the Lord Jesus, but I know that most people today, who come to faith, have very few of the Lord’s anointed in our families. My own mother became a Christian on her death-bed, my father became a Christian whilst in a coma; both of whom had been witnessed to by my brother Paul and I for years. We’d shared the Gospel, read the Bible, prayed for them, but they stubbornly refused to trust in Jesus, until they were in a desperate situation. However, Timothy had that witness. I’ve found as I’ve studied Timothy that Paul must have regarded him as a bit timid a bit weak in his faith and frightened to carry out his commission. His letters to Timothy are so full of encouragement to be faithful, to keep going, to be prepared to suffer for the Gospel. Sometimes, having faithful relatives and strong Christians in our family is NO guarantee that the faith they have will be shared by every member of the family. 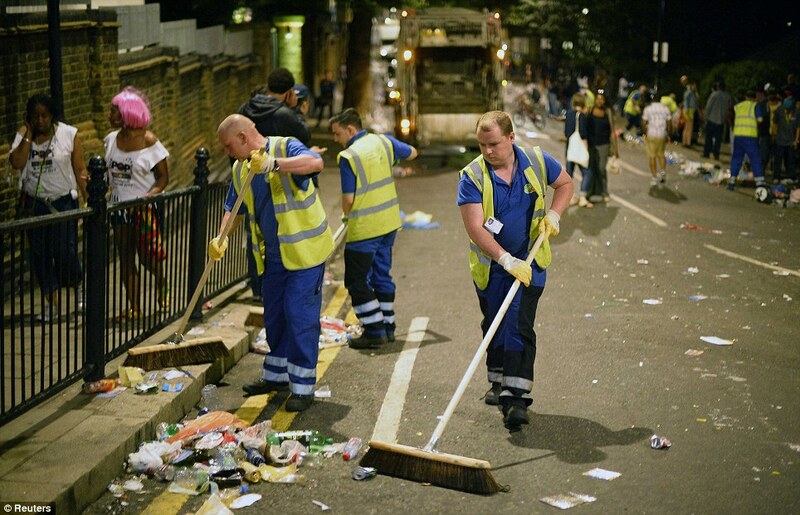 We meet people out on the streets of London every week who’ll say, “My grandmother was a woman of prayer”. As if that faithful old saint was enough, they didn’t need to do it themselves, because she did it for the whole family. I aways respond with “What about you?” Paul said, “I’m persuaded is in you”. He needed to be persuaded, to be convinced, to have it certified that Timothy really did have that same faith as his grandmother and mother. But he’d become convinced of it. Notice too that Paul was praying for Him day and night. I pray for my friends and some of you I pray for every single day, but I don’t pray for you DAY & NIGHT like Paul did for Timothy. He must have thought that Timothy needed his prayers, that something was lacking in his walk with Jesus. There’s NO Second-Hand Faith in God’s Family. I’ve found that when there’s been a very strong person of faith in a family, the rest of the family are not very fire-filled, they are like the Laodican Church in the book of Revelation; Luke Warm Believers. They don’t have the same kind of compulsion, zeal, commitment and drive to serve the Lord wholeheartedly. I’m not sure why that is, but it seems that a totally surrendered life and a faithful life to members of ones own family is a hindrance to those who live with them and know them personally. It’s like they depend upon the faith of the faith-filled rather than cultivate their own faith. I’ve known many Preachers children, great preachers and wonderful men and women of God, who’s own children’s faith is almost non-existent. I know they must be praying for them, witnessing to them and sharing Jesus with them constantly. But we must always bear in mind: “Remember there are no second-hand Christians in God’s Family.” We must all come to Saviour for ourselves. We are not Christians because our Grandmother or Mother was a believer. Perhaps Paul was wondering if Timothy really had been born-again of the Holy Spirit, he’d laid hands upon him to receive the gift, but wasn’t convinced it was a genuine conversion, because he’d not seen the evidence of it, but now he’s writing and he’s been persuaded and convinced (we don’t know how). We do need faithful Mothers, Grandmothers, Brothers, Fathers, Sisters of the faith today; who’ll encourage family members, who’ll pray for their children and grandchildren, but who’ll also lead them to the Lord so that the children will be set on fire with love for Jesus too. My four year old granddaughter Leila is a natural evangelist. She lives in South London, in Thornton Heath, which is an area full of Muslims. She can identify a Muslim and said to me the other day, “That lady is a Muslim grandpa, but we’re Christians”. She was out shopping with her mother in Tesco and at the check-out asked the Teller “Are you a Muslim? I’m a Christian, I love Jesus. You should love Jesus too”… She’s only FOUR and is a bold as a lion. Her mother, my daughter, apologised for her and said to her, “You don’t ask people that!”. There’s NO second-hand faith in the family of God. Each and every individual needs to come on their own to Jesus Christ, in faith, in repentance and to take Him as their own Master, Lord and King. I hope and pray that Timothy was faithful and continued in the faith, we just don’t know. Paul wanted him to “fan into flames” that gift of the Spirit. My friends, I want every Christian to be FULL OF FIRE OF THE LORD JESUS, AND FULL OF THE HOLY SPIRIT. No Second-Hand Faith in the Family of God. My friends, the weekend is coming, keep going with Jesus, gather with the saints on Sunday, worship Him, Love Him, Serve Him. He’s with you, in you and will encourage you to keep going in the strength that He provides. Mothers, keep praying for your children, but lead them to the Saviour for themselves. Grandmothers, pray for your grand-kids that they’ll get the FIRE for themselves. The Church today desperately needs faithful, fire-filled Grandmothers and mums, dads and granddads. The Church Today Needs The Sincere Faith and Prayers of Grandmothers and Mothers. Dads and Granddads.